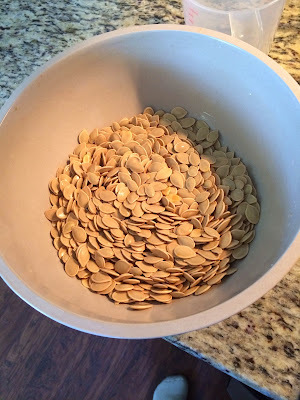 Pumpkin seeds are pretty much the sole reason I buy and carve pumpkins each year, I have one of those tierd stepped porches so I load up on pumpkins for both sides of each step, resulting in lots of pumpkin seeds each year. First, I place a large bowl of warm water with about a tablespoon of salt in it, next to my pumpkins. As I clean my pumpkins I place the seeds in that bowl. 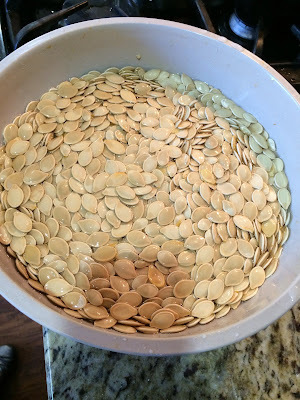 When finished I agitate the pumpkins seeds with my hands, cleaning any pulp odd of the seeds. I then dump my seeds into a colander, and rinse. I've also soaked my seeds overnight, my mother did it, so I do it, not exactly sure why, but I think soaking your seeds in salted water results in a crispier seed after baking, I've also never burned a seed, so that may also be an effect. 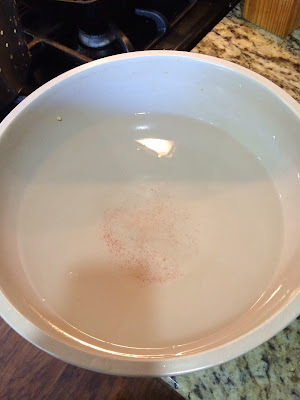 I just fill my cleaned bowl up with warm water, another tablespoon or so of salt and let the seeds sit on the counter overnight. The next morning I drain the seeds and lay them out flat on cookie sheets to dry out. Once they have air dried it is time to think about seasonings. 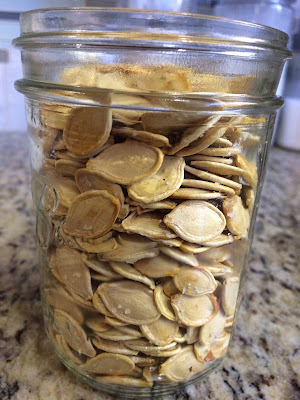 I literally have about 6 cups of seeds each year, so I make a plain salted one and then I usually pick a flavor to try out with some of the seeds. I've done garlic powder, chili powder, and chipotle powders in the past, but this year I'm going in a new direction. Pumpkin pie spice! 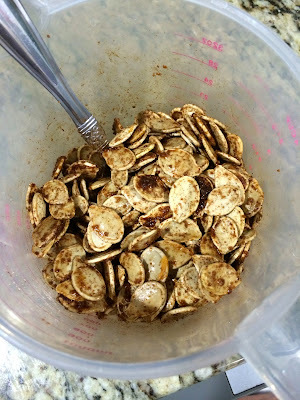 Toss seeds in olive oil and sprinkle with a course sea salt. 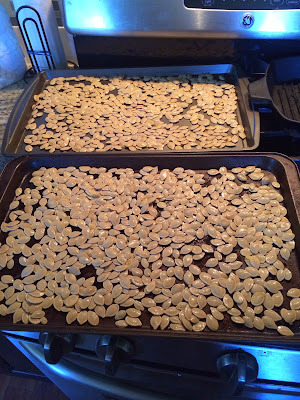 Place on baking sheets in even layers and bake at 250 degrees to 30-45 minutes until lightly browned. Stir at least once during cooking so both sides brown. For a sweet application I used butter instead of olive oil. 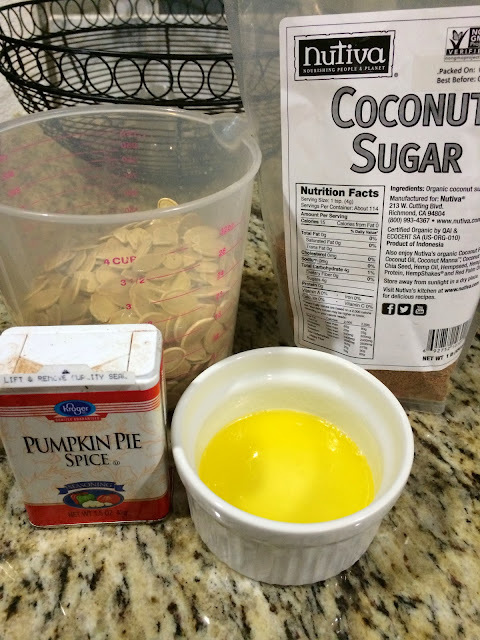 Toss seeds in melted butter, 1 tablespoon coconut sugar (or brown sugar) and 2 table spoons pumpkin pie spice. Again, bake at 250 for 30-40 minutes being careful not to develop too much color since this recipe has sweetners with it. Once they are finished I keep them in mason jars and let them cool completely. 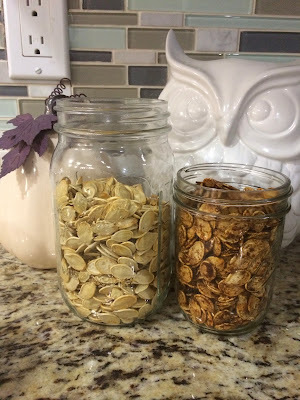 They are packed with nutrients and they are a fantastic snack to enjoy!